An estimated 3.5 billion wire hangers go into U.S. landfills every year, and they sit there for over a hundred years. That does not count the 1.25 million hangers in my closet at home. Leave it to American ingenuity to identify a problem and turn it into an advertising campaign. A New York company, EcoHanger®, is making a 100%-recyclable, biodegradable clothes hanger made of paper. (Oops, there goes another tree.) The hangers are free to qualifying dry cleaning establishments. Did I say, “free?” Here’s the catch: each hanger is imprinted with an advertisement. Big companies like Van Huesen, L’Oreal, Mitchum antiperspirant, and Duncan Donuts have already signed on to hang out in your closet with the EcoHanger. A typical wire hanger costs your dry cleaner about 8 cents—and no, there is no deposit, no return. Research shows that the typical wire hanger sits in your closet for an average of 6-8 weeks before being discarded, or used to open a car door. The brains behind hanger ads think the consumer will have no aversion to ads in their pants. “We are already distributing about 50 million hangers annually,” says EcoHanger CEO Bob Kantor. “It was not an idea that advertisers liked from the beginning, but now there is growing acceptance.” EcoHangers are part of what ad guys call “invited” media—a less intrusive form of advertising. 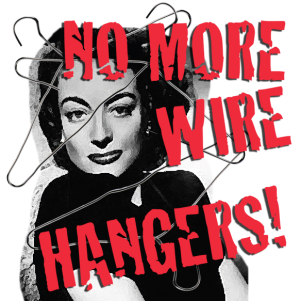 The obvious question: Does EcoHanger have any plans for using the famous line from Faye Dunaway’s Joan Crawford bio-pic, Mommie Dearest? Kantor says the copyright holder wanted way too much money. You can grow an astounding array of flowers, vegetables and herbs from seeds right here in Texomaland, if you just don’t let the instructions on the seed packets intimidate you. “Start seeds indoors six weeks before first frost-free date,” they direct you. Balderdash!